Home » Neem Fade Cream - 2fl. oz. 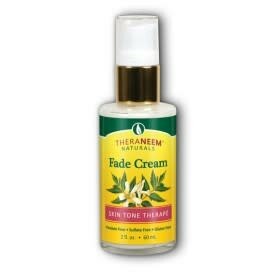 Neem Fade Cream - 2fl. oz. To minimize the appearance of dark spots and increase brightening, apply to skin twice daily. Paraben Free, Sulfate Free, Gluten Free! Directions: To minimize the appearance of dark spots and increase brightening, apply to skin twice daily. For maximum effect, use for a minimum of three months. Use with sunscreen. For topical external use only. Discontinue use if irritation occurs. Contains: Aqueous extract of Azadriachta Indica (Neem) Leaf, Aloe barbadensis Gel, Glycerin (Vegetarian), Helianthus annus (Sunflower) Oil, Capric/Caprylic Triglycerides, Polysorbate 80, Simmondsia chinensis (Jojoba) Oil, Persea gratissma (Avocado) Oil, Extracts of Malva sylvestris (Mallow), Menta piperita (Peppermint), Primula veris (Cowslip Primrose), Alchemilla vulgaris (Lady's Mantle), Veronica officinalis (Speedwell), Melissa officinalis (Lemon Balm), Achillea millefolium (Yarrow), Azadirachta Indica (Neem) Seed Oil, Phenoxyethanol and Caprylyl Glycol, Mixed Tocopherols (Natural Vitamin E), Sodium Acrylates Copolymer, Fragrance (parfum from natural ingredients).